100% Premium grade, High tenacity, U.V. 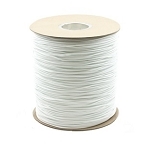 Stabilized Nylon Diamond Braid Cord. Nylon offers superior abrasion resistance and is used in awnings, apparel, bag, tarping, and other applications.